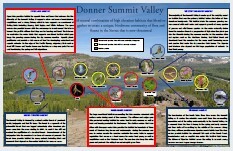 As many of the visitors of my website OnTheSummit are aware we have been advocating the preservation of Van Norden Lake and its surrounding wetlands in the Donner Summit Valley. Here I would like to lay out the issues surrounding the Van Norden dam that are currently threatening the lake and wetlands. For more information please view these online visual presentations. 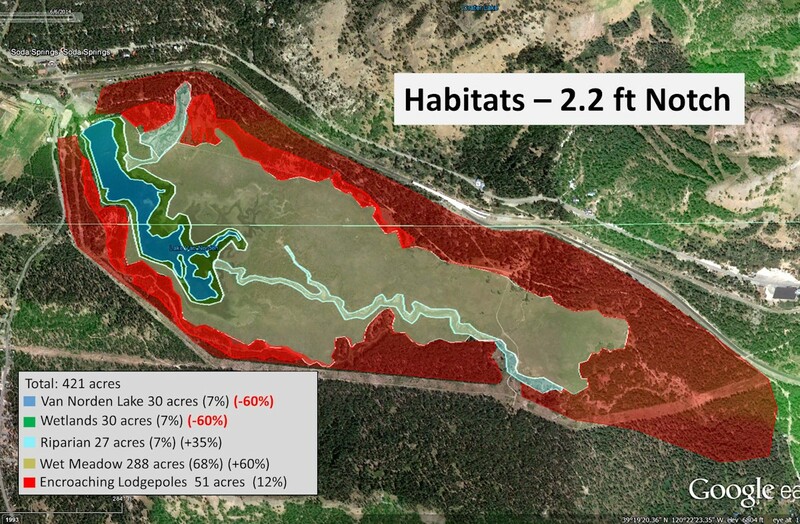 The disposition of Van Norden Lake and its surrounding wetlands is going to be decided in the next year by the Truckee-Donner Land Trust (TDLT). 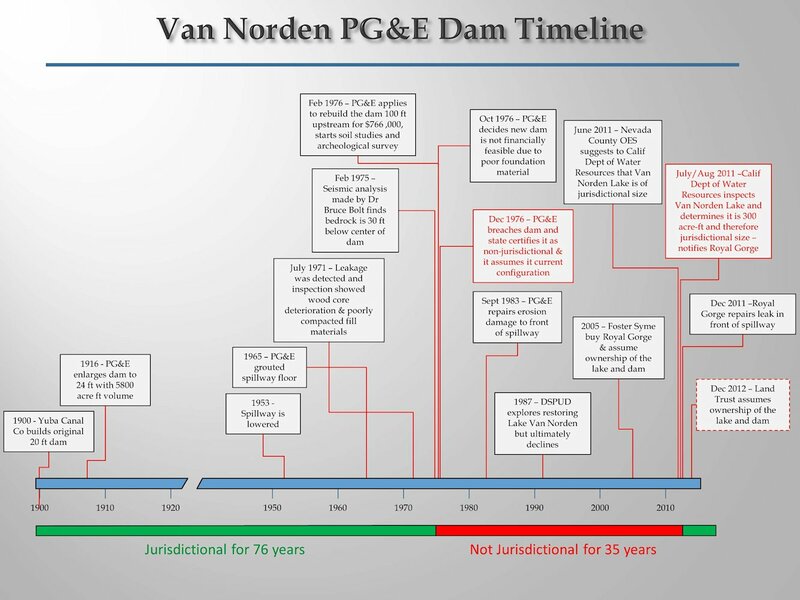 The venerable Van Norden Dam is currently under the jurisdiction of the California Division of Safety of Dams (DSOD) and they have declared it to be out of compliance and is requiring that it be brought into compliance. TDLT originally proposed a plan to breach the dam by 2.2 ft to leave a 49 acre-ft dam that would bring it into compliance with the requirements of the DSOD and remove it from their jurisdiction. Unfortunately, at the beginning of 2014 TDLT changed this plan to breaching the dam by 5 ft to drain the lake and wetlands, effectively removing the lake and wetland habitats. 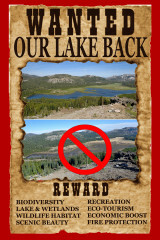 This move was in response to the directive from the US Forest Service that they would not buy the land for $2 million dollars if the lake remained. In 2014 a group of us tried to purchase the land containing the lake and wetlands from TDLT with the intent to permanently preserve this area as a wildlife reserve. TDLT refused to sell it to us but did agree to retain ownership of the land containing the dam and apply for water rights for a 49 acre-ft lake. Unfortunately, the Forest Service, as future owners of the remaining meadow are would not meet or negotiate with us and we had to suspend the deal because we could not proceed without a commitment from them to support the 49 acre-ft lake. 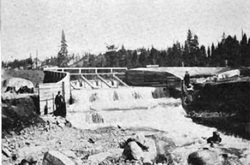 The history of the dam in Summit Valley stretches back over more than 100 years (see timeline). Through a chain of serendipitous events the valley currently consists of a blend of five ecological habitats including a 70 acre open water seasonal lake and its adjoining wetlands as well as another 200+ acres of wet/dry meadow and riparian habitats. Any solution for fixing the dam will have serious consequences to the habitats in the valley. Realistically, the only financially feasible solution for fixing the dam is to reconfigure it so that it is no longer under the jurisdiction of the State. This means that the dam must either be reduced in height to below 6 ft or the volume of the lake must be lowered to below 50 acre-feet. A bathymetric analysis by Balance Hydrologics showed that the current spillway would need to be lowered 2.2 ft to reduce the lake to less than 50 acre-ft. Either of these alternatives by themselves will lower the lake significantly and will completely remove the large back bay area of the lake and its adjoining wetlands. 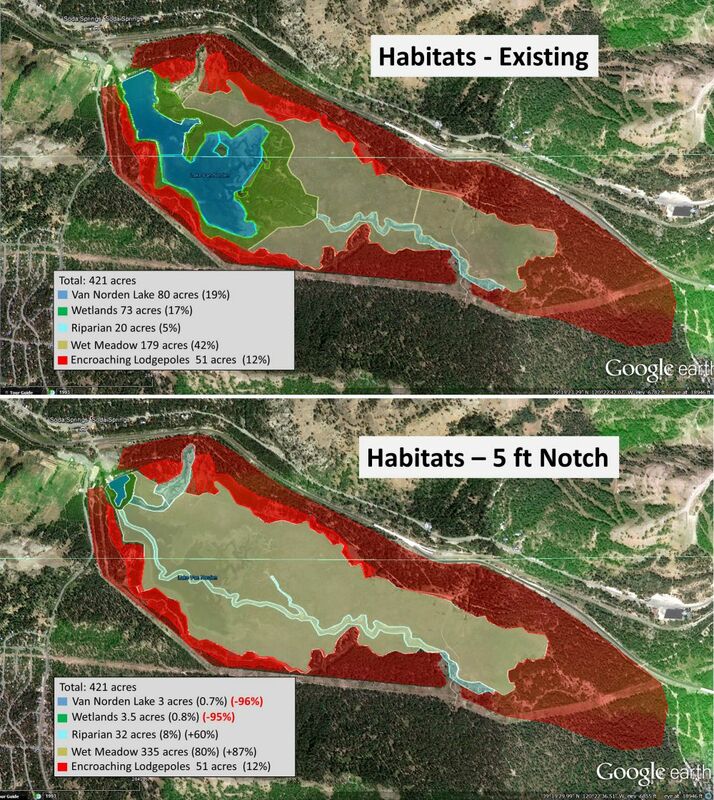 The solution presented here is a compromise that would retain approximately 40% of the open lake and wetland habitats in the valley. The existing dam can be notched down to 2.2 feet which will make it less than 50 acre-ft and remove it from the jurisdiction of the state. Compare this to the drastic destruction of the lake and wetland habitats that would result from the TDLT plan to drain the lake. We can see exactly what the results would be because TDLT was forced to drain the lake in October 2015 because of their inaction on procuring water rights to impound water behind the dam. The results were dramatic and showed clearly that the existing lake and wetland habitats would be decimated. Unfortunately, TDLT has chosen to hide the destruction of the lake and wetlands under the mantle of “meadow restoration”. Their strategy has been to speak only about their plan as meadow restoration and ignore the fact that they are destroying valuable habitat. They have tried to make the argument meadow vs lake when if fact the two have existed synergistically in the Summit Valley for over a century. We believe that the presence of the lake and wetlands serves only to enrich the biodiversity of the Summit Valley and that there is no ecological reason to destroy the existing habitat. It is true that Van Norden lake is the result of the man-made Van Norden dam. However, nature is the ultimate opportunist and for the last 37 years it has established the current ecosystem in the valley that includes the open lake and wetland habitats that support a rich bio-diversity resource. 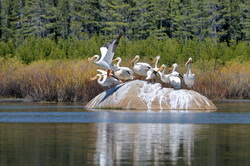 Man made lakes and wetlands are a common tool used throughout the world to foster wildlife and preserve habitat and millions of dollars are spent to create and support these projects. The Sacramento NWR is perfect example just a short distance from the Summit Valley. Each year large areas of wetland are created through irrigation in the central valley to provide a winter home for millions (yes millions) of migratory ducks, geese and cranes. If you have never visited one of the reserves to see the Snow Geese fly then you are really missing a special natural experience. Another example of the creation and maintenance of open water and wetlands is the world famous reserve of Bosque del Apache in San Antonio, New Mexico. If you want to see the ultimate example of human powered creation and preservation of this valuable habitat, watch the video below. When you consider the millions of acres of natural habitat that have been lost in the development of this country, there is something inherently satisfying when with just a little effort we can preserve some of that habitat. 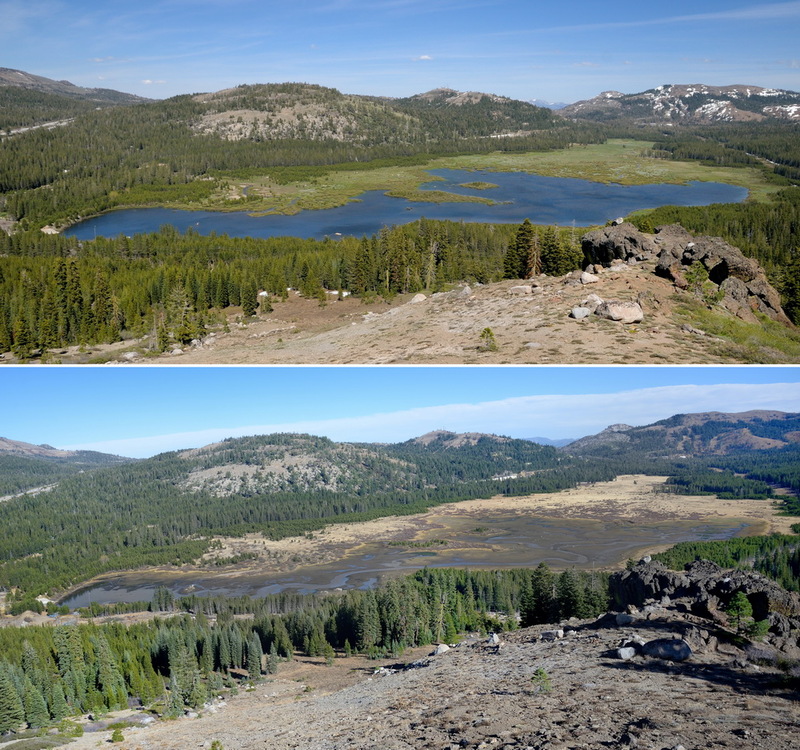 Maintaining the open lake and wetland habitat that support a rich diversity of aquatic fauna and flora in the Donner Summit Valley can be nothing but an ecological win for everyone. 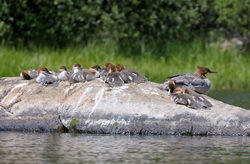 Common Mergansers come to breed on the lake. 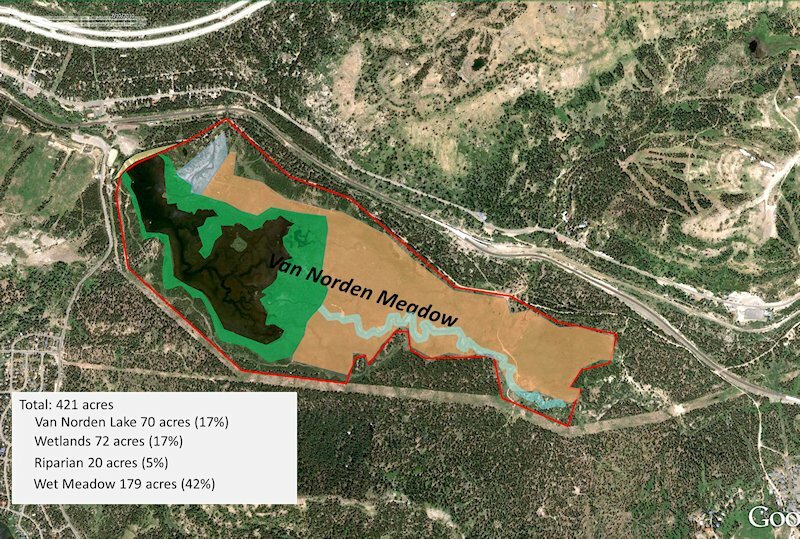 The disposition of Van Norden Lake and wetlands is currently in the hands of the Truckee-Donner Land Trust and also indirectly the US Forest Service which is slated to purchase the property in the next two years. If TDLT proceeds with there plan it will mean the destruction of over 100 acres of lake and wetland habitat. The Truckee-Donner Land Trust has made a commitment to resolve this situation to optimize the resources in the Summit Valley. Part of that optimization includes the enjoyment of the valley by the people that visit it, including you. If you agree with the idea that the valley should continue to include valuable and bio-diverse lake and wetland habitats, then make your feelings known to the land trust and the Forest Service. You can do this by contacting TDLT directly at their website. You can also contact Joanne Roubique, the Tahoe Forest District Ranger for the US Forest Service. You can also contact the government officials that have jurisdiction over the lake and wetlands. View our What you can do page for more information. I agree with you; the 2 lake solution is elegant, the least invasive and disruptive of the current environment. I think it is important to maintain the current water acreage for the migratory birds and the amphibians we know depend on that lake. I have witnessed the migration of thousands upon thousands of toads to the lake. Keep up the good work. I also agree. if this is an alternate solution than absolutely it is the answer. Why would anyone want to make a current wetlands less than anything than what it could be if there is an alternative solution like the 2 lake option? All wetlands are in peril due to this years drought. This is only the beginning! LETS PRESERVE THOSE WE HAVE! If Royal Gorge can be saved , then………????? Yes. Make an effort. I strongly support the 2 lake option. It’s less intrusive and preserves natural habitat over which humankind should exercise responsible stewardship. I agree, the two lake option. Every year my granddaughter and I go to Lake Tahoe for a week. I always take the old Highway 40 route because it is so beautiful. We always stop and look at this beautiful meadow. This year we will actually go down to the meadow and have a walking adventure. It has been very interesting reading about the history of Summit Valley and Lake Van Norden. I hope your efforts are successful. I have reached out the TDLT with little to no response about the status on this, but maybe I should be connecting with someone over here. This has been a special place for me growing up in Tahoe Donner. Super sad to see animals take off and be forced out. Something needs to be done but emails and phone calls to the TDLT only go so far I feel. Let me know if there is anything else we can do to help. Would love to be involved.